Our candles are divinely inspired to be part of your personal empowerment journey. We've been making these amazing candles since 1992. Our pillar candles are all paraffin, cotton wick, fragrance oil blends and made when the moon is right. If you are concerned about burning paraffin candle, please read our article on Paraffin vs. Soy. 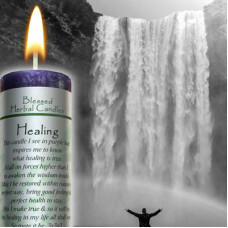 Healing Blessed Herbal Candle is a spiritual purple candle with a mellow honeysuckle & cedar oil..
Healing Blessing Kit is a triad of Healing, Protection and Problem Solving. Votives burn for 10 hour..
Healing Power Votive is a spiritual purple candle with a mellow honeysuckle & cedar oil blend. B..
Heart Blessed Herbal Candle is a blossoming lavender colored candle with a matching fresh ylang and ..
Heart Power Votive is a blossoming lavender colored candle with a matching fresh ylang and lavender .. Helping Hand Hoo Doo Candle is a rich dark blue candle with an earthy bergamot & frankinsence bl..
High John Hoo Doo Candle is a deep dark purple candle with an uplifting patchouli blend. 2” x ..
Home Blessing Blessing Kit is a triad of Happy Home, Protection and Stability. Votives burn for 10 h.. Inner Balance Blessed herbal Candle is a sky blue candle infused with cedar, sage and jasmine oils. .. Inner Balance Power Votive is a light blue candle infused with cedar, sage and jasmine oils. Box of .. Inner Beauty Affirmation Candle is a deep aqua candle with a grapefruit and ginger blend. 2”x4..
A brilliant blue candle with a breath of lavender. 2x4 pillar with a 40 hour burn time. A perfect c.. It Suckes to be You Wicked Witch Mojo is a cedarwood and vanilla blend in a black 2”x4” ..
Jinx Removing Blessing kit is a triad of Energy, Needed Change and Protection. Votives burn for 10 h..
Magenta candle with a heady sandalwood & jasmine blend. 2.5” x 6.5” 80 hour burn tim..
Love Affirmation Candle is a blush colored candle with a musky woods scent. 2”x4” pillar.. Loves Enchantment Blessed Herbal is an enticing pink color with a spicy jasmine blend of oils. 1.5&r.. Loves Enchantment Power Votive is an enticing pink color with a spicy jasmine blend of oils. Box of ..
Luck Affirmation Candle is a brilliant orange candle charged with Spicy Sandalwood. 2”x4”..